How to Wear Eyeliner. So if you happen to be one of those who are practically in love with the idea of eyeliners and admire and worship those who have amazing eyeliner skills and often find yourself surfing through stunning eyeliner snaps on the internet that took over fashion – then this post is meant for you. But what the actual situation for you is that you happen to be not so terrific at eyeliner application no matter how terrific looking you are yourself and that’s why we here right now.Furthermore, no matter how hard you tell yourself otherwise, you simply cannot manage to step out of the house with touching up with a little gorgeous eyeliner last minute application. And we can completely understand why. But need not be worrisome at all, we are now going to show you some cool and epic ways to nail a perfect eyeliner look that will take away all the remorse. Pencil eyeliner happens to be very easily applicable than the others. While it also happens to be not so smoothly or thickly textured as liquid or gel happen to be.Gel eyeliners are the ones most adored by consumers – and that’s because they are matte (which everyone loves) and secondly they glide on quite effortlessly. They are seldom sold in small pots with a brush, which further makes them more approachable. 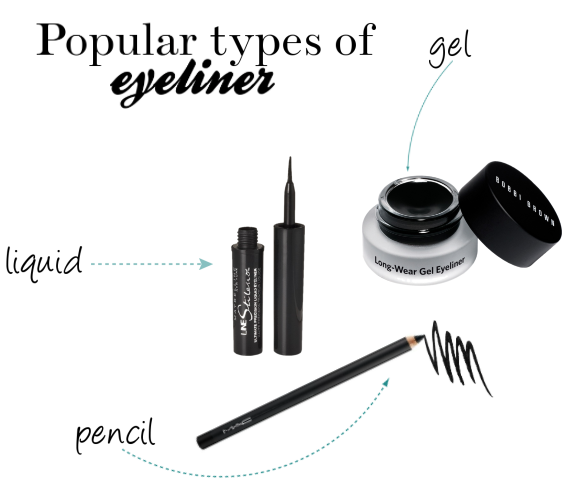 Liquid eyeliners are preferred by those who want preciseness in their eye makeup. Liquid eyeliners are mostly sold in tubes or pen-style. Not so appropriate if you happen to be in a hurry since they may take a while to dry up. Now time to hand over the handy tips and techniques you need, to have a perfect eyeliner makeup. 1- Sit down on an even surface, where you won’t shift positions. 2- Then locate your elbow on a flat surface. 3- While applying, make sure that your pinky is resting on your face while holding up your hand. This leads to least possible jerks of your hand, hence fewer mess ups. This is for those who are under the spell of liquid eyeliners and we suggest you start with the dots and then join them into a curve. This trick will mostly work if you are using a liquid one rather than any other. The small video clip below shows exactly how it has to be done and nailing it. Go with small dashes/underscores rather than the dots if you think that’s more feasible. The perks with dashes would be that there would less drawing of the line left for you later, but the dashes have to be in the right curve style or else it will be a mess. Just be patient and be careful with your way of applying eyeliner and you are done. The most important aspect to keep in mind as a novice would be to not pull the skin siding your eyes because when you release it it’s going to wrinkle and mess up the hard effort of yours. Although you would not have to really start over, but if there’s a little mess than you can easily rid yourself of it by a cotton swab or a small piece of cotton. But in any case, it’s best if you just won’t bother with the skin, keep you hand in the air and your pinky finger supporting it by resting on your face. That’s the best go! Now the big deal here is that you won’t be redoing all your effort if you undergo a mess up smudge or wrinkled texture. That would take longer than it should and that’s just wasting time. So we have an alternate for that. A small application of concealer or a dab of a primer can work miracles for you and your smudges apparently. Just take a small and a minor volume of it on the stick provided and apply it over the liner smudge until it becomes invisible. You would see a clean work created by magic. Always know how petroleum jelly can come in very handy in such cases. You can randomly try out first by drawing out a messier line over your eye and then refining it with the petroleum jelly. Look for help, below! Or if you happen to be inaccessible to petroleum jelly, a regular transparent lip gloss would work too and take away the smudge with it. The Best part you will find about this lip gloss remedy is that you can instantly apply with less volume on a stick and all good! Never should the smudge brushes be neglected and think down about – because those locked sticks in your drawers will now come in handy in a way you never knew. Your edgy and flawed or you can say not so impeccable eyeliner will be dealt magically by a smudge brush. Yes, black eyeshadow is definitely a savior. If you don’t like the further effort of smudge brush, etc. then simply applying black shadow is enough. The translucent powder too has its days and yes, these are the ones where it will prove its true potential. Once you apply your liner where you want it to be, you can easily prevent the crease stamp with translucent powder.